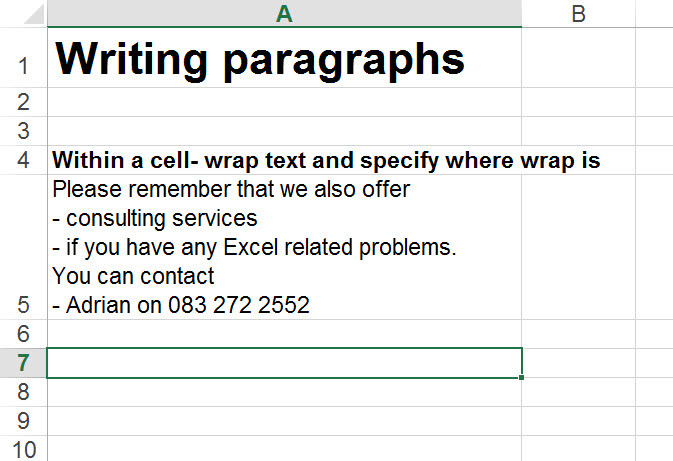 Although not as powerful as MS Word when writing text, there are some tricks you can use to write paragraphs in excel. If you have the following sentence in a cell and for whatever reason you don’t want to resize the columns you can try the following options. click the WRAP TEXT option. For whatever reason, occasionally the wrap text option does not seem to increase the size of the rows to take into account the extra text. In this case you may need to increase the size of the row manually. You can do this by hovering your mouse over the line just below the row number until it turns into a single horizontal line with arrows coming out of it as shown below. You can now either drag the line down to your required height or else double click it so that excel does the sizing. As shown below, we have created a paragraph by dropping the text every 3 or 4 words. You can create bullet points in this way within an excel cell. Excel is not great for creating text with bullet points within a cell. 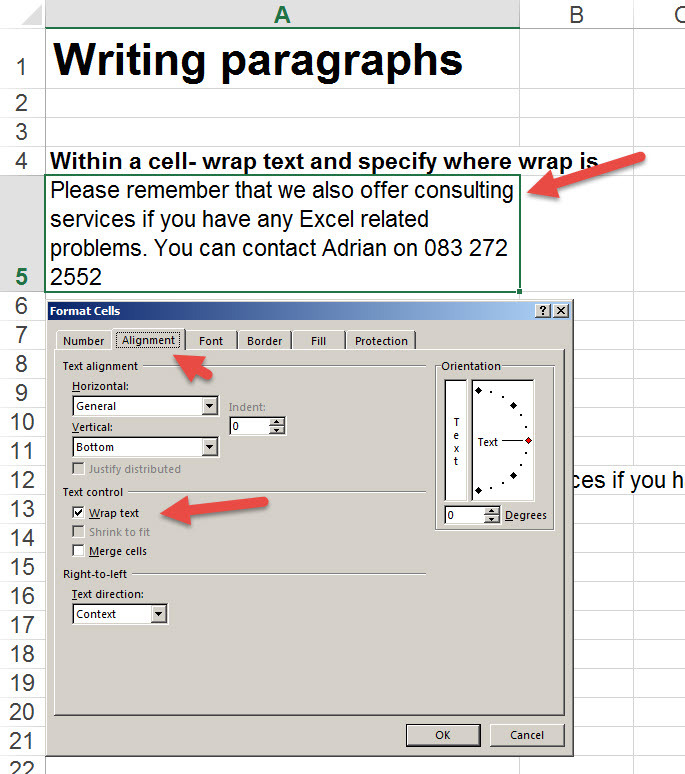 Another way to do this is to write the paragraph in MS Word and copy and paste it INTO the cell (note this is not click on the cell and paste, but rather click IN the cell as shown by the red arrow below and paste). Although not exactly the same as the Word version, it is sometimes quicker to achieve this via Word then to try and format completely in Excel. 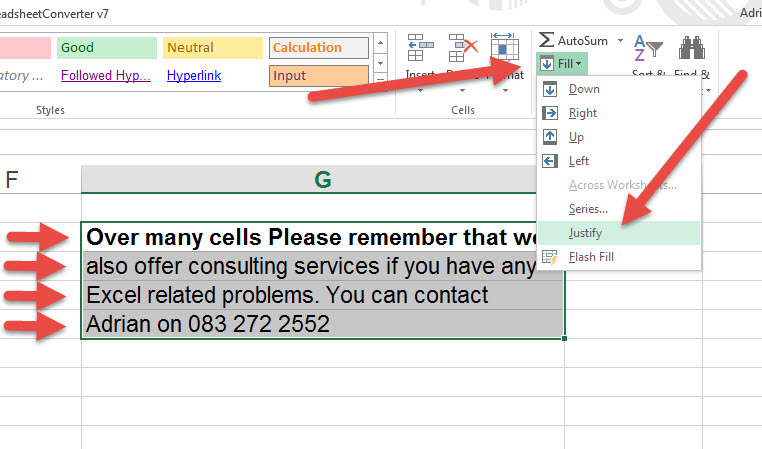 If you want to write a long paragraph in a single cell, and then have excel place it into as many cells as required to fit within the column (as apposed to everything in one cell), you need to highlight the cell with the sentence and a few cells below it, click on the HOME tab, FILL and then JUSTIFY. The following will result. Notice that the text is now spread across many cells but fits within the column. Another useful tool within Excel for formatting text is the alignment tools within the Home tab. The most commonly known options are the Left, Centre and Right Align buttons. Below is an indication of what they look like and the buttons to use. Less well known are the vertical alignment options i.e. top, center or bottom. By default Excel puts text at the bottom of cells. 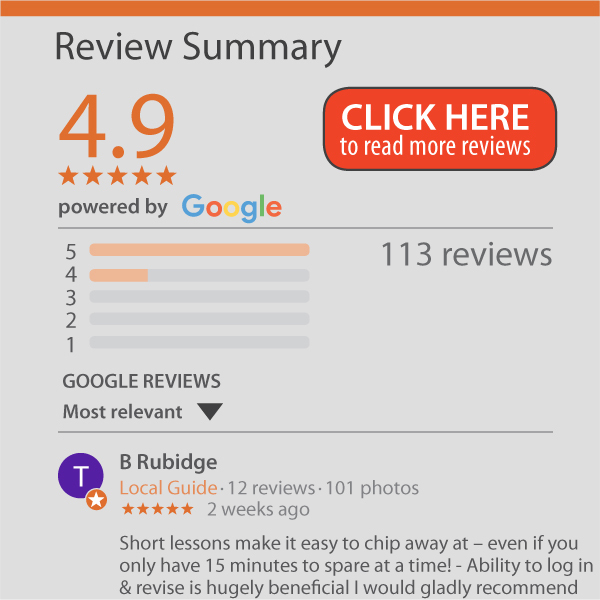 When the cell heights are not aligned to the text size (perhaps due to one of the cells in the row containing more text), it means that text is shown at the bottom. In order to improve this, you can align these cells so that the text starts at the top, or centre. As shown below, it is easier to line up the text in this case. You can also choose center or bottom alignment.